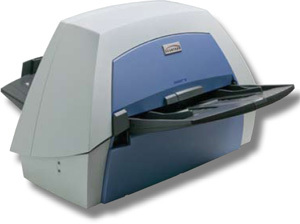 The iNSIGHT 30 from Scantron is an industry exclusive: a desktop model scanner combining high-quality, high-speed, full-color Document Imaging technology with the proven Data Collection capabilities and accuracy of Optical Mark Recognition (OMR). In developing this innovative technology, Scantron has applied over 50 years of engineering, forms design, applications development and customer support experience to ensure our customer's success. Whenever you need the speed and accuracy of OMR along with the productivity and flexibility of Document Imagining, the iNSIGHT 30 is the right solution for you. The advanced technology offers genuine versatility at a lower cost of ownership than owning separate hardware. Due to its unique blend of capabilities, the iNSIGHT 30 is well positioned to address demanding applications such as testing, surveys, attendance, grading, student portfolios, personnel records, archival, and general back file conversions.